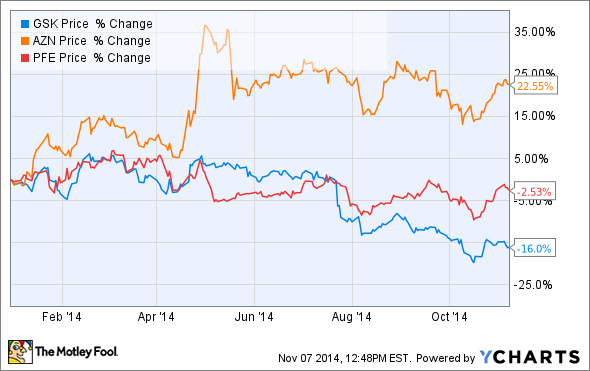 Should you invest in GlaxoSmithKline, AstraZeneca, and Pfizer for their beefy dividends? Large pharmaceutical companies are often known for their generous dividends. Let's check in on three such income generators -- GlaxoSmithKline (NYSE:GSK), AstraZeneca (NYSE:AZN), and Pfizer (NYSE:PFE) -- to see if their businesses can back up their yields. GlaxoSmithKline offers a forward annual dividend yield of 5.4%, but its stock has slumped 16% over the past year year due to lackluster sales growth and a PR-damaging bribery probe in China, which resulted in a 3 billion RMB ($490 million) fine. In October, GlaxoSmithKline reported a 3% year-over-year decline in quarterly revenue, although its core earnings per share rose 5%. A key reason for that decline was rising competition for Advair, GlaxoSmithKline 's blockbuster respiratory drug that previously generated over $8 billion in annual sales. During the first nine months of 2014, global Advair sales dropped 14% year over year to 3.1 billion pounds ($4.9 billion). Two newer GlaxoSmithKline respiratory drugs meant to replace Advair, Breo and Anoro Ellipta, got off to a slow start with 35 million pounds ($55.4 million) in combined sales over the first nine months of 2014. 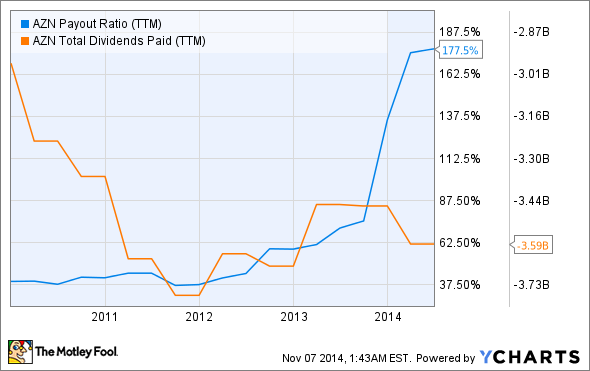 Despite those top-line concerns, GlaxoSmithKline is aggressively protecting its bottom line. It swapped its oncology unit for Novartis' vaccine unit in April to cut costs, is selling off a portfolio of older drugs worth over $3 billion, and is mulling a public spinoff of ViiV Healthcare, its HIV joint venture with Pfizer and Shionogi. As a result, GlaxoSmithKline 's top-line performance might remain weak for now, but its dividend should remain safe. Moreover, GlaxoSmithKline has a history of boosting its dividend payout ratio well above 100% to reward patient shareholders. AstraZeneca's forward annual dividend yield of 2.5% is less than GlaxoSmithKline's, but its stock also rallied 23% over the past year -- which was partially caused by Pfizer's aggressive $120 billion takeover attempt. AstraZeneca's biggest near-term challenge is generic competition for Nexium, its acid reflux drug that generated $3.87 billion in sales (15% of its top line) in 2013. Luckily, the launch of a generic version was recently delayed, which allowed the company to raise its full-year guidance. Looking beyond Nexium, AstraZeneca will focus on two key areas: diabetes and cancer. In February, the company bought out Bristol Myers-Squibb's half of their diabetes joint venture, which houses promising drugs including Farxiga, Byetta, and Bydureon. Farxiga is a rival SGLT2 inhibitor to Johnson & Johnson's Invokana, which helps patients excrete more sugar through the urine. Byetta and Bydureon (two doses of the same drug), are rivals to Novo Nordisk's Victoza, which help insulin lower blood sugar more effectively. AstraZeneca's cancer pipeline -- which was Pfizer's main target -- includes several promising drug candidates for ovarian, lung, and other cancers which could each have peak sales potential between $2 billion and $6.5 billion per year, according to the company. All those drugs play a part of AstraZeneca's promise to grow its top line by a whopping 75% to $45 billion by 2023. As for its bottom line, AstraZeneca is also willing to pay out over 100% of its earnings during leaner times. Pfizer stock, which pays a forward annual dividend yield of 3.4%, has stayed flat over the past year due to worries regarding its drying pipeline and desperate bid for AstraZeneca. Pfizer continues to struggle with declining sales of Lipitor, its former blockbuster cholesterol drug that generated sales of $13 billion in 2011. Due to generic competition, Lipitor only generated $1.49 billion in sales during the first nine months of 2014. Between fiscal 2011 and 2013, Pfizer's annual revenue dropped by 15%, although it aggressively protected its bottom line and dividends by slashing jobs, selling and spinning off businesses, and raising prices on prescription drugs. 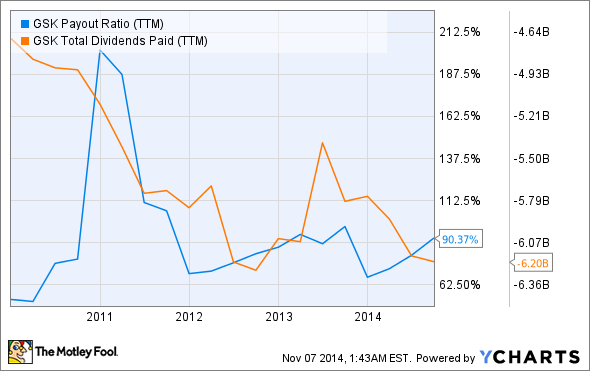 While Pfizer's dividend is certainly stable, its sales outlook is less clear. For now, investors should pay attention to two key drugs: palbociclib and bococizumab (RN316). Palbociclib, a breast cancer treatment, is expected to generate between $2 billion (Bernstein) and $6 billion (ISI) in peak sales if approved. RN316 is a "next-gen" PCSK9 cholesterol drug that will compete against Amgen's evolocumab and Sanofi/Regeneron's alirocumab if approved. Peak sales estimates for both evolocumab and alirocumab run as high as $4.3 billion (Leerink Partners), which bodes well for bococizumab. Pfizer filed a new drug application for palbociclib in August, while bococizumab is in phase 3 trials. Over the long term, newer drugs might help Pfizer grow its top line again. But for now, Pfizer only trades at 13 times forward earnings and hovers near its 52-week low, making it a fairly low-risk income investment in my book.